The Blackfoot River outside of Missoula, Montana, is one of Montana’s most iconic waterways. Made famous by Norman Maclean’s “A River Runs Through It,” the river winds its way through the mountains and Potomac Valley outside of Missoula. The Bureau of Land Management Missoula Field Office manages 12 miles of the Blackfoot River. The Blackfoot River’s waters are cold and fast with many deep spots, which makes it an ideal habitat for several trout species. 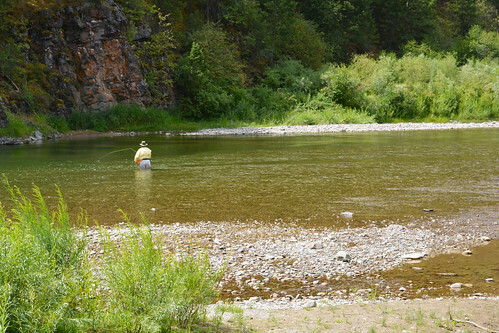 Those who fish the Blackfoot can fish the exact holes detailed in Maclean’s novella. The river also is destination for many floaters who are looking to cool off in the summer months. Day use areas and campgrounds are spread out along a well-maintained dirt road that follows the river and winds it’s way up the canyon. For more information about the Blackfoot River, visit on.doi.gov/1K1Jhom. Story and photo by Alyse Backus, BLM Montana/ Dakotas.